"At 9:30 A.M., October 23, 1864, General Curtis's troops from Blunt's Division formed a line along Brush Creek facing south. Jennison's Brigade was west of Wornall; Ford's Brigade east of Jennison's to Oak Street; and Moonlight's Brigade along State Line facing east. Colonel Blair's Kansas Militia Brigade was west of Jennison. Union artillery was to the north firing on the Confederates to the south. About 4,500 men were in line at sun up. Blunt moved south with part of his division and was driven back by Shelby's Confederates." Directions to Stop #2: Tour Stop 2 is located near the intersection of Sunset Drive and Ward Parkway. Drive east on Westport Road and turn right (south) onto Broadway (turns into J C Nichols Parkway). After crossing the bridge over Brush Creek, turn right (west) onto Ward Parkway. After ab out one third of a mile, veer left (southwest) onto Sunset Drive. The marker will be on your right shortly after you turn onto Sunset Drive. 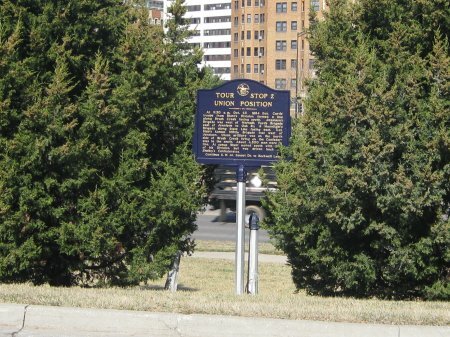 This tour stop is located in Kansas City, Missouri 64112. At a right angle to the First Brigade along the state line was Colonel Thomas Moonlight's Second Brigade supported by a battery of 4 guns. Brigadier General M. Jeff Thompson's Iron Brigade (Shelby's Division) was in the center with units from Colonel Sidney D. Jackman's Brigade (Shelby's Division) formed on both sides of Thompson. They were supported by Captain Richard A. Collins' Missouri Battery. Supporting were Colonel Archibald S. Dobbins' Brigade and Colonel W. F. Slemons' Brigade, both from Fagan's Division. They were supported by Blocher's Arkansas Battery. The skirmishers met in the misty dawn hours and began firing. Dismounted cavalry moved forward and began firing at the advancing Confederates. McLain's Battery opened fire soon after these shots. For an hour the exchange of fire continued. Shelby and Fagan increased the pressure and pushed the Union First and Fourth Brigades back to the north side of Brush Creek and the Second Brigade was pushed back to Shawnee Mission. By midmorning, the Union attack had failed and they were back where they had started at dawn. However, Shelby could not press further for ammunition had run low. It took an hour to replenish his Confederate troops. He had lost the advantage. Shelby and Fagan waited on the heights south of Brush Creek (Tour Stop 5). By 11:00 A.M., Curtis had come forward to join Blunt and planned to direct the Union advance. But before he could do so, Blair's Third Brigade on the extreme right crossed Brush Creek and went into action around 11 am. Curtis supported Blair's attack and ordered the remaining Federal forces forward. Shelby countered this attack with reinforcements and once again the Federals withdrew to Brush Creek. Curtis regrouped and then advanced again.